Adding pistachio nuts to your daily diet could be an easy way to improve cholesterol levels, say researchers from Turkey, the world’s fourth biggest pistachio nut producer. The US is currently the number two producer of pistachios in the world, with annual production of about 136,000 metric tons (302m lbs). Exports of the nuts are worth almost $100m every year with Europe getting the lion’s share of the exported nuts (71 percent). The new study, published in the journal Nutrition, Metabolism and Cardiovascular Diseases (Vol. 16, pp. 202-209), randomly assigned 44 healthy volunteers with an average age of 33 and a BMI of 24.5 kg per square meter to a regular diet (control) or the test diet with 20 percent of the daily calorific intake from pistachio nuts. 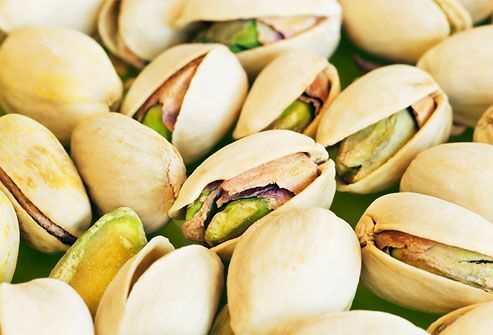 After three weeks of the diet, the researchers, from the Medical Faculty of the Harran University in Turkey, found that plasma levels of total cholesterol decreased by 12 percent for the pistachio group, compared to baseline, and HDL cholesterol levels increased by 26 percent. The ratio of total cholesterol to HDL, reported to be the most specific lipid risk factor for cardiovascular disease (CVD), fell by 21 percent from 3.98 to 3.17. The ratio of LDL to HDL also fell from 1.82 to 1.58, equal to a drop of 14 percent. No significant changes in any of these levels were observed for the normal diet group. 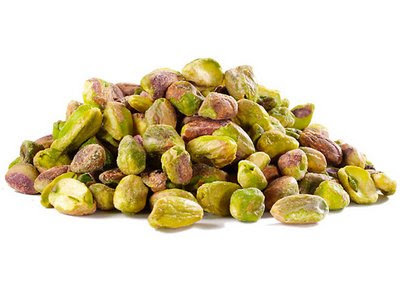 Interestingly, the antioxidant profile of the pistachio group also improved with the malondialdehyde (MDA), reactive carbonyl compound, falling from 2.11 nanomoles per milliliter of plasma to 1.68 nanomoles per milliliter. The antioxidant potential (AOP) also improved, rising from 1.83 to 2.68 micromoles per milliliter. “These results suggest that the modification of diet through the use of pistachio nuts may raise AOP levels favorably and improve plasma total cholesterol and HDL without weight gain in healthy volunteers,” wrote the researchers. The actual mechanism of action, said the scientists was not known, but suggested that the improvements in lipid profile may be due to the high monounsaturated content of the pistachios (32.6 grams per 100 grams of dried nut), or the high concentration of phytosterols (108 milligrams per 100 grams). Pistachio nuts are also a rich source of antioxidant vitamins A and E (gamma-tocopherol). The researchers called for further research into the mechanism behind the benefits. High cholesterol levels, hypercholesterolemia, have a long association with many diseases, particularly CVD, a disease that affects 34.2 percent of Americans (70.1m people), according to the American Heart Association. NutraIngredients-USA.com is a daily online news service available as a free-access website and provides daily and weekly newsletters to subscribers.The service seeks out news stories and data of value to decision-makers in food and beverage development in Europe.The NutraIngredients-USA.com team is led by award-winning journalists. They scan all available scientific, technical and industry sources and search out previously unpublished material, primary data and expert opinions in all areas of significance to the target audience.